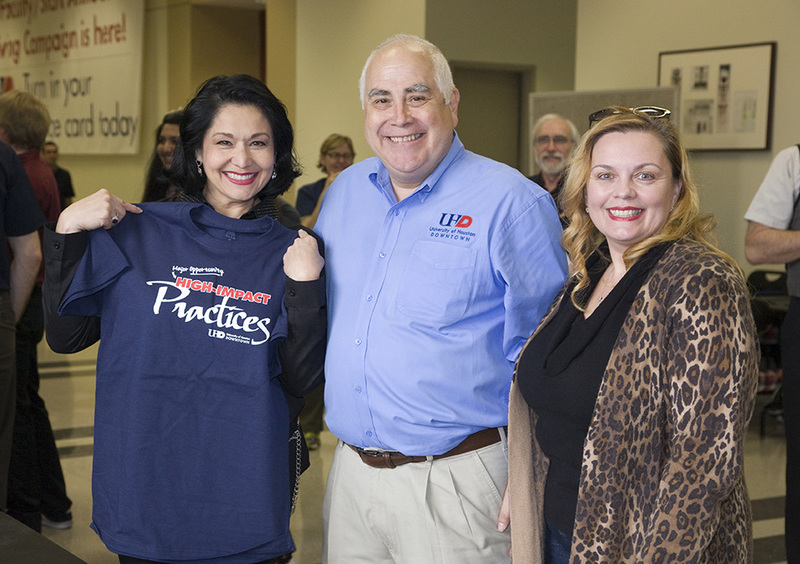 University of Houston-Downtown (UHD) President Bill Flores recently granted three faculty and staff leaders with the University's inaugural President's Community Engagement Award for their outstanding service beyond the classroom and campus. Faculty award winners include Maria Bhattacharjee, associate professor of urban education, for her work pairing science and urban education majors with elementary students to introduce exciting science fields, in addition to her support of Crockett Elementary; and Judith Harris, assistant professor of criminal justice, for her senior seminar course that pairs students as case managers with jail inmates in a novel reentry program. Flores recognized Paulette Purdy, director of Administration and Operations in the College of Public Service, as the staff award winner for her efforts to organize events and donation drives for the House of Tiny Treasures - an early childhood development center dedicated to serving homeless children and families in Houston. Flores initiated the President's Community Engagement Award based on recommendations from the University's Service Learning and Community Engagement Committee. Earlier this year, the Office of the President asked all faculty and staff to complete an online survey regarding their community service. Nominated candidates then submitted a summary of their work in the community. The committee received many excellent nominations with extraordinary community service efforts. 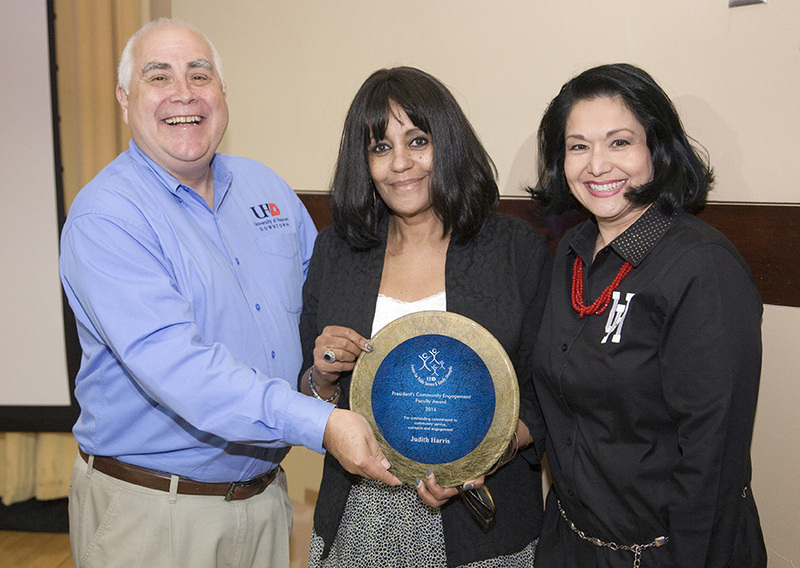 "This award reflects UHD's strong commitment to community engagement," said Flores. "As our mission states, UHD 'engages with the community to address the needs and advance the development of the region.' In supporting our community, we set the example of volunteerism and service for our students and help to instill this important priority in our city's future leaders." 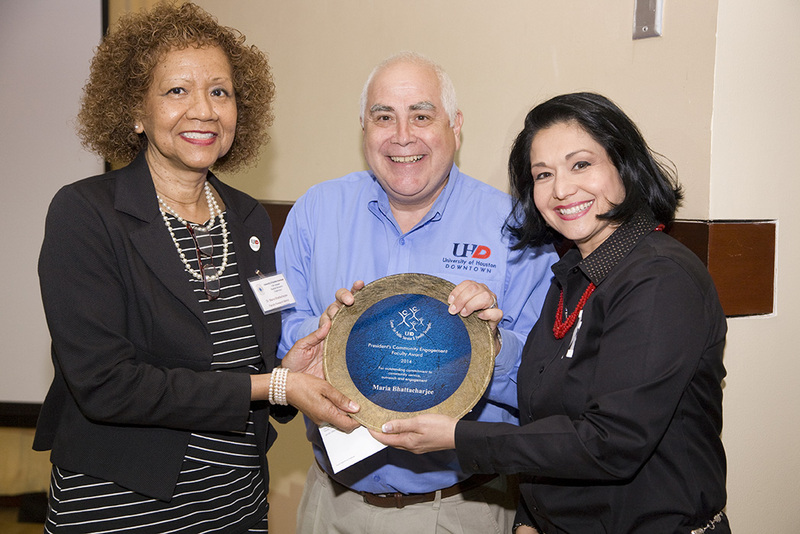 Flores and UH System Regent Paula Mendoza presented the award winners with a plaque and monetary award at the University's annual High-Impact Practices Showcase last Friday. "The winners of this award have demonstrated a broad range of community engagement activities on and off campus," said President Flores. "I am proud to acknowledge these outstanding faculty and staff members who have proven their commitment to making an impact on our students, the University and our surrounding communities." The Service Learning and Community Engagement Committee, which selected the award winners, is composed of faculty members from each college and community-minded staff from each department. With community service a hallmark of UHD, this committee will continue to lead the University in efforts to serve and support the Houston community.